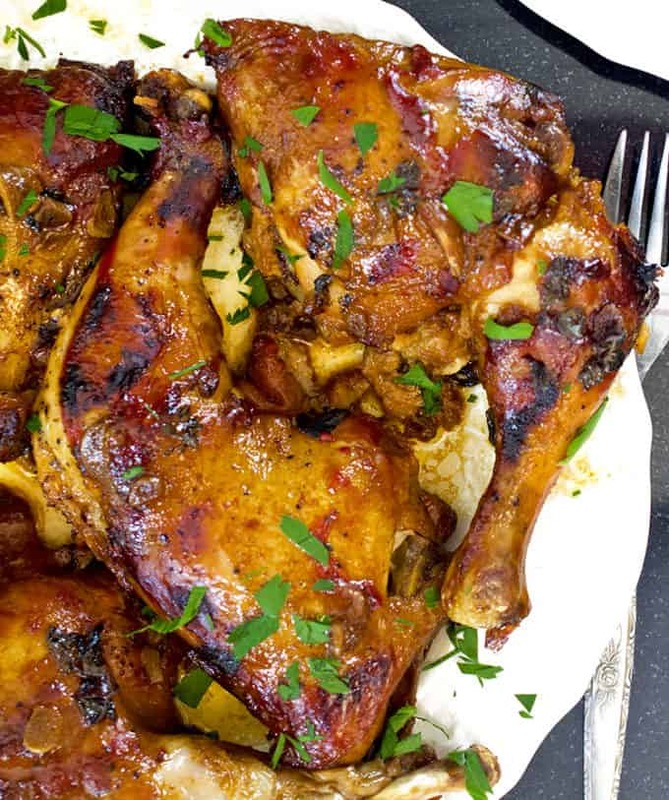 This slow cooker chicken thighs recipe cooks all day while you do your own thing. Go to work, hit the gym, stop by the farmer’s market. Do whatever you want and come home to this delicious slow cooker honey and garlic chicken meal. Make this crock pot chicken recipe for less than two dollars per serving. This recipe for slow cooker chicken thighs uses just a few ordinary ingredients that you probably already have. We put this latest crockpot chicken recipe together at our little weekend oasis located on a small lake in the middle of Nowhere, Wisconsin. It’s a tranquil place to get off the grid, hit the nearby farmer’s market, drink a little wine, and do a lot of cooking. 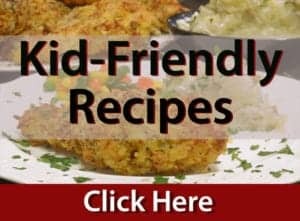 Some of our best recipes are made at our lake cottage and often with the kids helping out. We’ve made such great recipes as our Sweet and Savory Grilled Eggplant, our Cottage Cake, our Crustless Vegetable Quiche, and many, many more. Our latest crockpot recipe of slow cooker chicken thighs uses just a few ordinary ingredients that you probably already have on hand. It costs less than a couple of dollars per serving and uses nothing more than a slow cooker. This wonderful crock pot honey garlic chicken recipe is perfect for the cottage or wherever this may find you. All you need is a crock pot for this slow cooker chicken recipe. No need to mess up your entire kitchen! Place the chicken quarters in a single layer, skin side up. 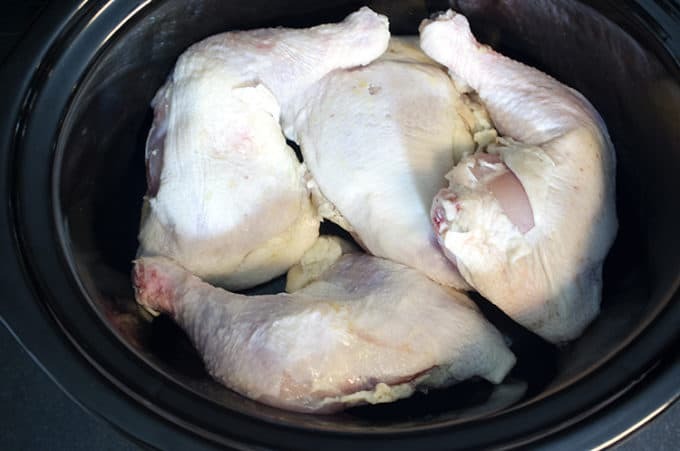 Start by placing the chicken quarters in a single layer, in your slow cooker. Although you can use chicken breast, dark meat will add more flavor. 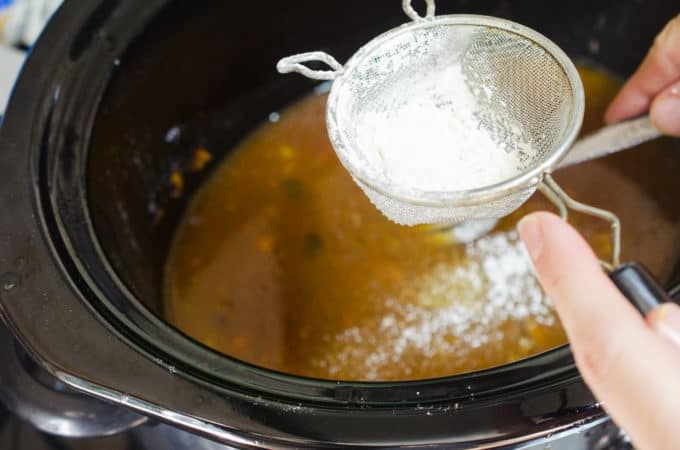 There isn’t a lot of liquid in this slow cooker recipe and so leaving the skin on helps prevent it from drying out. You only need a small number of ingredients for this slow cooker chicken recipe. Importantly, only a very small amount of ingredients is needed for this crockpot meal. Water is cooked out during the process so cutting back on the quantity of barbecue sauce and honey will help reduce the amount of liquid in the slow cooker when the chicken is finished cooking. 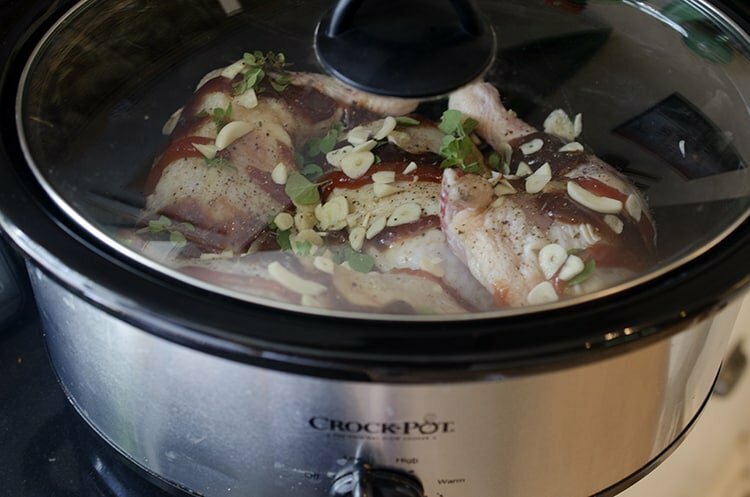 Cook this crock pot chicken for 6-7 hours on low. We’re going to put this small amount of liquid to good use. One of the things that makes crock pot meals so great is their convenience. 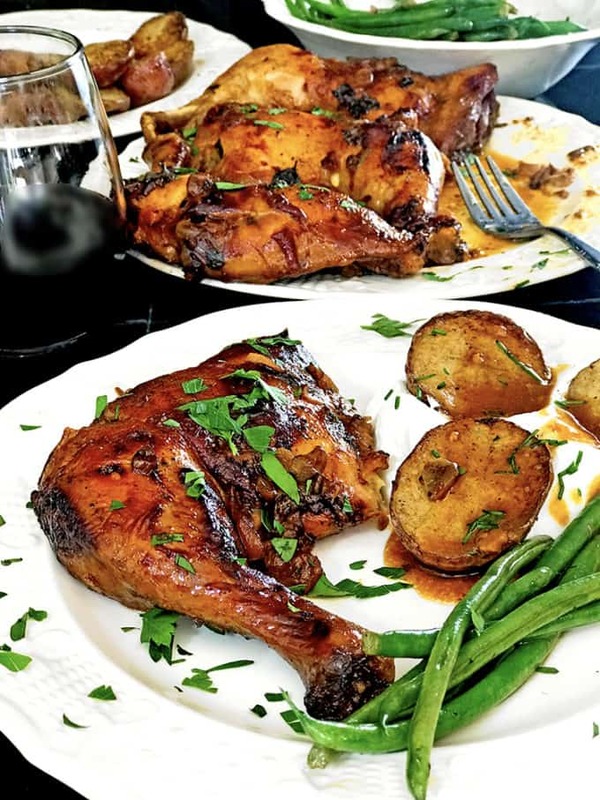 After you put all the ingredients in your slow cooker, you can just set it to low and come home to an incredible meal of crock pot honey garlic chicken. Once the chicken is finished cooking, you’re going to place it on a baking sheet and brown it under your oven broiler for just a couple of minutes. Doing this will give it a nice caramelized finish and taste. While the chicken is browning up a bit, you’re going to make good use of the leftover liquid in the crock pot. 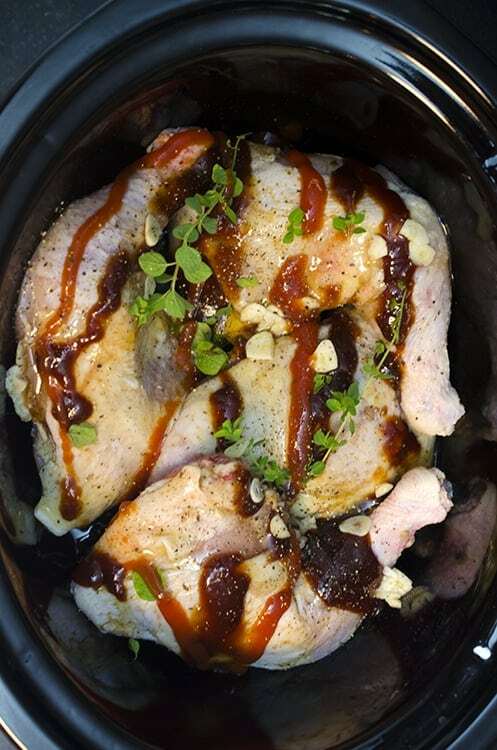 Make a flavor gravy with the juices from this crock pot chicken recipe. I grew up loving gravy, and that is one thing that hasn’t changed since I’ve grown old and bald. I will actively seek the chance to make gravy anytime when I’m in the kitchen. If you’ve ever wondered how to make gravy, there are many methods. With this slow cooker chicken recipe we are going to keep it very short and very simple. Turn the crock pot to a high setting which will help reduce the liquid. Then, place a tablespoon or two of flour and put it in a small fine mesh strainer. Then, use your finger to tap-tap-tap a little flour into the liquid, a little at a time, while continuously stirring with a fork. This will give you a nice gravy with no lumps! If you want to learn more about how to make gravy, check out our gravy recipes that include our Southern Giblet Gravy and our post on How to Make a Roux. 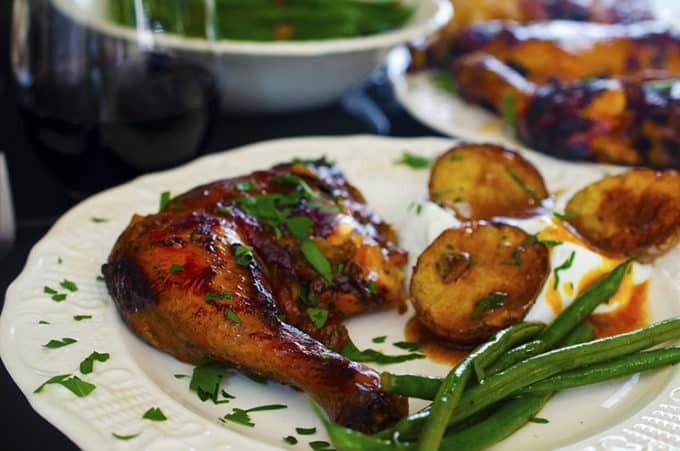 We serve these slow cooker chicken thighs with green beans and oven-roasted red potatoes. If you want to assemble and freeze the ingredients for this slow cooker meal, simply put them in a freezer back and be sure to freeze them flat which will allow for even defrosting. Allow them to thaw and defrost for 24 hours before cooking and just follow the recipe card below. We love easy chicken recipes here on platter talk and are all about crock pot meals. 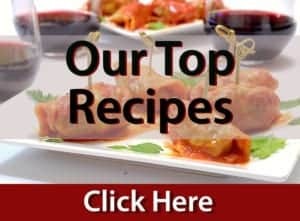 Take a look at more of our crock pot chicken recipes! This crock pot chicken recipe is part of Freaky Friday, a seasonal blog hop that we have been participating in for a couple of years now. Food bloggers are secretly assigned to another food site within the group, and our assignment is to recreate a recipe of our choosing, from their site. 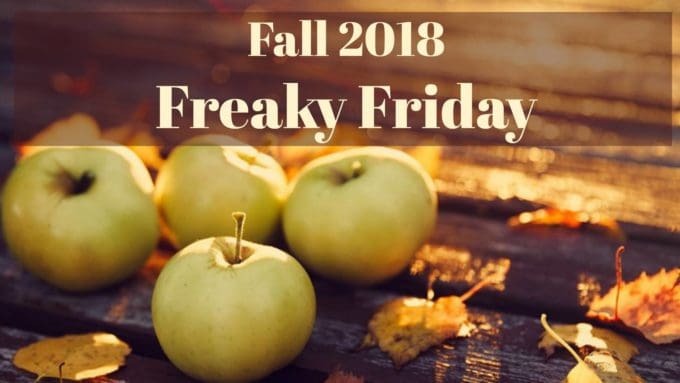 Be sure to check out the other great freaky Friday recipes listed below! This recipe for slow cooker chicken thighs takes minutes to prep and is made using one pot - your slow cooker! 4 Chicken leg quarters Bone-in, skin on. 2 tbsp Barbecue Sauce Spicey flavored. Place chicken quarters, skin side up, in a single layer of your slow cooker. Add remaining ingredients, cover and cook on low for 6-7 hours. When the chicken is done, brown it for a minute or two, under your oven broiler. Pin this recipe for slow cooker chicken thighs for later. WOW!!! This sounds perfect! I love to make this chicken for the next work potluck! I know it would be a hit! What a gorgeous meal!! I love using my crock pot — it makes lief so much simpler!! Slow cooker meals are the best! I need to make these for dinner soon! I use my crockpot all the time! Especially in the winter. This looks amazing and I love that you made a gravy to go with it from the yummy drippings! Definitely an oldie but a goodie from our site! You did a great job with this easy to prepare meal! 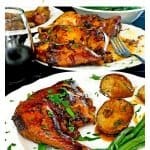 This slow cooker chicken thighs looks delicious I like that you made gravy also with the sauce left in the slow cooker. Yummy meal for busy nights. I love honey and garlic together but the soy sauce sounds like it elevated everything. This looks like a great chicken thigh recipe my whole house would love! Can there be a better combination for chicken then honey and garlic with a touch of soy. Love that salty sweet taste. And I’m so glad you’re making it in the slow cooker. It’s a time saver for us busy people. These chicken thighs are so crispy. The way I love them! I can’t believe you made then in the slow cooker! I love how simple this chicken is to make. 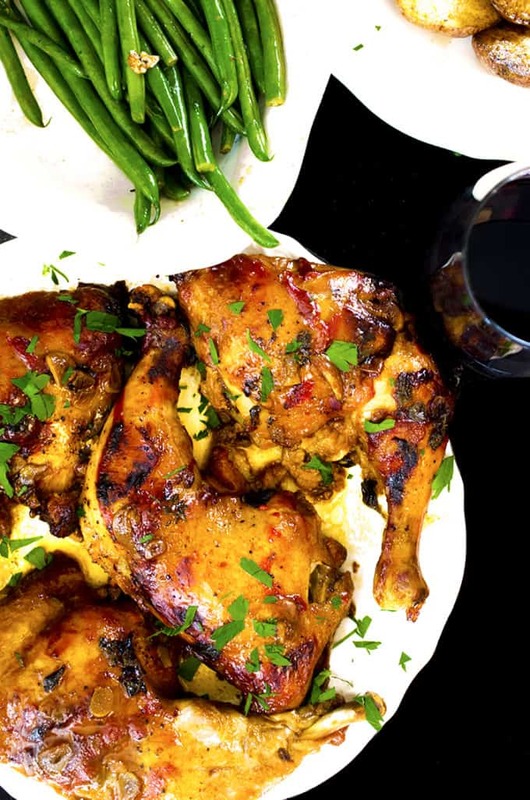 Honey garlic is a great flavor combination and he chicken looks terrific. Wow! That looks amazing and so simple! Definitely a must-try! I love slow cooker meat recipes because they are so simple, easy and always fork tender. This sounds packed with flavor and color. Yum. I love my slow cooker. This chicken looks juicy and delicious. Perfect for a dinner any night of the week. This would be a family pleaser for sure. 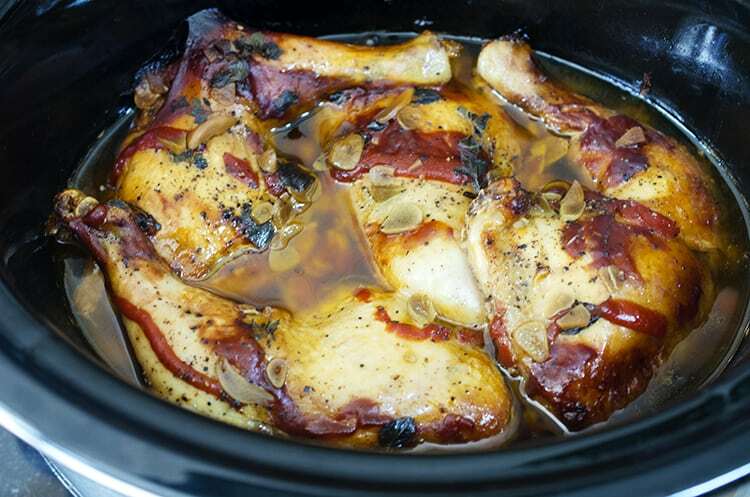 Oh God, what a tasty looking this slow cooker chicken is! I am in love with the colors and how simple and short the ingredient list is. Yum! we love chicken thighs and the slowcooker makes them so tender I would love to try this recipe soon ! Looks like you picked a fantastic recipe! I absolutely love how budget friendly and tasty the chicken thighs are. 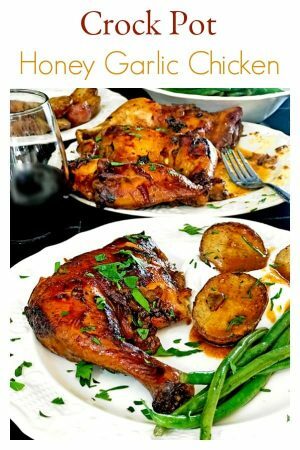 This recipe is right up my alley being easy and flavorful and one that the whole family will enjoy. This chicken looks absolutely amazing! I love how easy the slow cooker makes this recipe! It’s perfect for a busy weeknight or a lazy weekend! Thanks, Lisa! We love slow cooker meals! I love easy recipes that are effortless made in the crock pot. The chicken looks delicious. I cannot wait to make it! This is one of those recipes where I look and think Can it really be that easy? Love that you’re using a slow cooker for this amazing meal!